We dug 12 post holes in all; four large enough for gate posts, eight fencepost-sized. Not by hand, of course, or at least not entirely by hand. 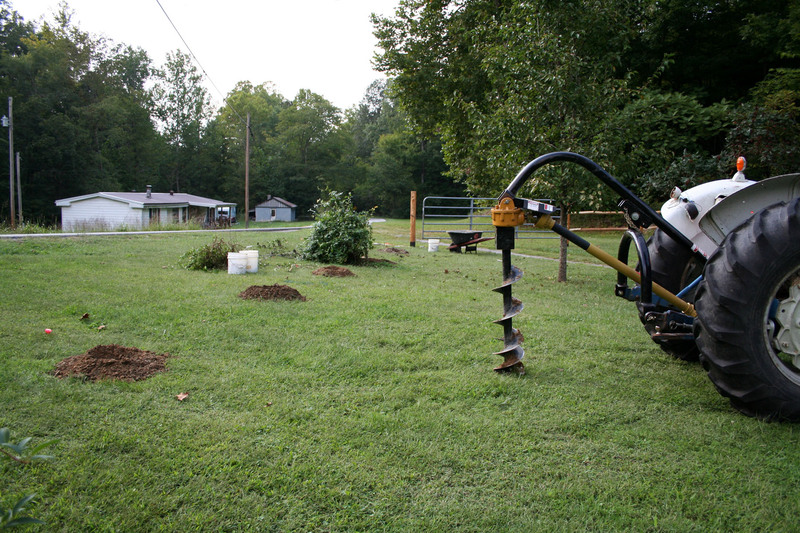 The PTO-operated posthole digger with a 9- and a 12-inch auger did most of the work, but Kentucky has its share of rock, which resisted the machine’s auger tip and had to be busted out by hand. The old-fashioned way, with the tools you see here, and lots of elbow, back and arm grease. Once the buried layer of rock had been punched through, the auger was able to finish the dig. I’d say of the 12 holes, only 3 were uncomplicated by a 4-inch layer of rock that lies about 12-inches beneath this area. 1) Lining up post holes is easier said than done. Check them after they’re dug by propping the posts up in the holes and stringing a line across their tops, if you want the fenceline to be straight. We measured and flagged every one, but they all had to be adjusted before the posts were set. Posthole diggers are not precision instruments. 2) Body weight helps when using the spud bar to break rock. Get the guy to do that part. 3) Don’t even think about digging postholes or setting posts without a spud bar. Tool of choice, nonpareil. As for plumbing the posts, the approach varied from the textbook version of using a level since our posts weren’t milled perfectly uniform from top to bottom like store-bought posts would be. 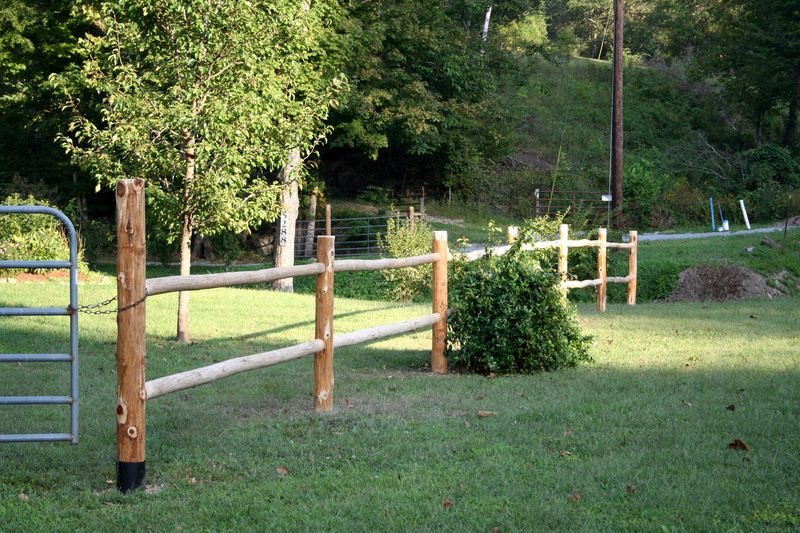 Cedar trees taper and are larger at the bottom than the top – how to plant a post plumb then? 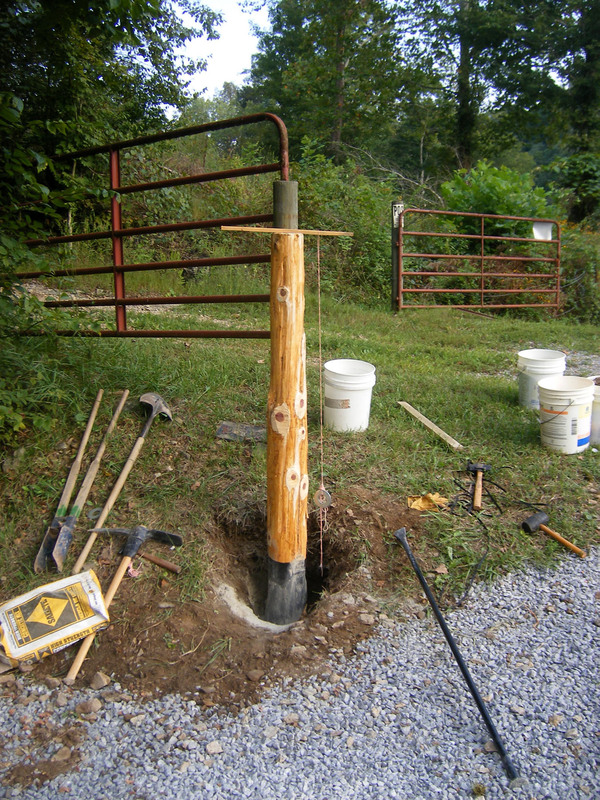 Skidder had the solution, learned from prior experience; a stake laid across the top of the post with a line and plumb bob hung from the end gives a vertical reference through the post’s center. Viewed from two different angles 90 degrees apart ensures a perfectly plumb post. Worked like a charm. I’ll plumb all my posts this way from now on.